This basin and a now lost ewer were used for rosewater. They would have been brought to the table for diners to wash their hands at the end of the meal. When not in use, the basin was meant to hang vertically with the dolphins and the grotesque mask at the top. There are holes at the top, from which it could be suspended. Christiaen van Vianen (active 1600-67) came from a famous family of Utrecht goldsmiths. He worked for Charles I and after the Restoration became 'silversmyth in ordinary' to Charles II. His work was mostly in the fantastical style developed by his father and uncle, Adam and Paul van Vianen. 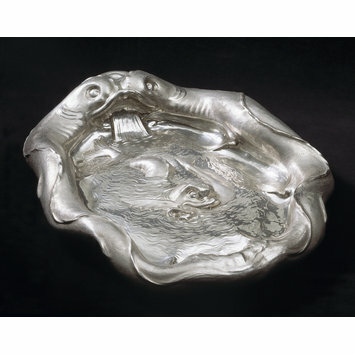 Although this basin is not hallmarked, it was signed by him on the reverse 'C.d. Vianen fecit 1635', just as painters signed their work. The 'auricular' style of this piece refers to the shape of the human ear. It combines exaggerated marine and natural forms with grotesque figures in swirling patterns. The style was developed by Adam van Vianen in Utrecht in the first two decades of the 17th century and used extensively by his son Christiaen. In this instance, the silver has been raised and embossed from a single sheet into brilliant, illusionist shapes. This demanded great skill on the part of the craftsman. 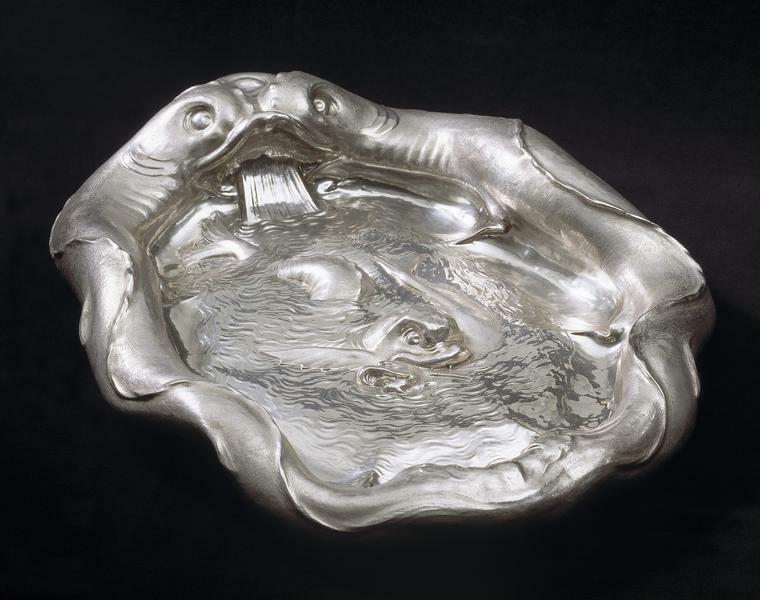 The dolphins and other marine shapes on this basin are appropriate for a vessel used for washing. The dish has a raised, wavy undulating rim in the form of two dolphins, the heads of which come together on one of the short sides, water appearing to stream from them into a dish. Among the waves on the bottom can be seen a dolphin pouncing on a smaller fish. Philippa Glanville, Silver in Tudor and Early Stuart England (V&A Publishing, 1990), pp.472-3. Baarsen, Reinier, with Ine Castelijns van Beek. Kwab. Ornament as Art in the Age of Rembrandt. Catalogue of the exhibition 'Kwab. Dutch Design in the Age of Rembrandt' at the Rijksmuseum, Amsterdam, 30 June - 16 September 2018. Amsterdam: Rijksmuseum, 2018. ISBN 978-94-6208-428-5. Charles I invited the Utrecht born goldsmith Christian van Vianen to London. His masterpiece of illusion is made from a single silver sheet. A dolphin swims in a pool of water framed by twin dolphins conjoined to form a grotesque mask. Charles displayed this silver sculpture in his private cabinet. This remarkable silver sculpture was created by Christian van Vianen, son of famous Utrecht silversmith Adam van Vianen, who died in 1627. Christian, ‘excellently skilled in the chasing of plate’, moved to London in the 1630s perhaps encouraged by an artistically minded patron, Thomas Howard, 14th Earl of Arundel. From 1632 Van Vianen received an annual pension from King Charles I and he employed 11 craftsmen at a large workshop in Westminster. Few of his pieces survive; most were melted down either by the King to fund the royalist armies in the English civil war, or during the Commonwealth. In 1643, when war began, Christian returned to Utrecht and only returned when the English monarchy was restored under Charles II. In the 1660s, he re-established his workshop in Tothill Street, Westminster. He employed John Coquus, his son-in-law, who we met earlier, in extract 9, the Silver Fire Furniture. Coquus succeeded Van Vianen as silversmith to the king, Charles II. The basin is signed and dated, which tells us that it was regarded as a work of sculpture. It was displayed by Charles I alongside his collection of smaller paintings and bronzes in his cabinet rooms at Whitehall Palace. Christian’s silver was highly regarded during his life time, and featured in a still life painting by the artist Willem van Aelst.